Araucana Chickens most unique quality is the color of its eggs. They can range from an aqua blue color to green hues and even pink or yellow. Class: Standard All other standard breeds. Bantam All other combs, clean legged. Size: Standard Male: 5 Ibs. / Standard Female: 4 Ibs. 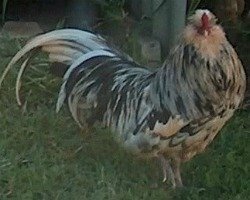 Bantam Male: 26 oz. / Bantam Female: 24 oz. Comb, Wattles & Earlobes: Small pea comb; wattles are very small or absent; earlobes are very small and smooth and covered by an ear tuft. All are bright red. Another distinction of this breed is the absence of a tail. Saddle feathers flow over the rump. Black: Black beak, shanks and toes; brown eyes; standard black plumage. Black-Breasted Red: Horn beak with reddish bay eyes and grayish yellow shanks and toes. Male: Head, hackle, and saddle are reddish changing to gold at lower extremities. Front of neck and breast are lustrous black. Tail and wings are black with reddish bay highlights. Under color is slate. Female: Head and hackle are reddish chestnut against a light brown body. Tails and wings have some black. Under color is slate to light brown. Golden Duckwing: Horn beak with red eyes and willow shanks and toes. Standard duckwing plumage. Silver Duckwing: Horn beak with red eyes and willow shanks and toes. Standard silver duckwing plumage. White: Yellow beak, shanks, and toes with red eyes. Standard white plumage. Special Qualities: Lays multicolored eggs, sometimes referred to as Easter eggs because of their varying colors. Araucana Chickens were developed in Chile in the early 1900's. They are a very unique breed. They were developed by a professor of animal science. He took ancient birds kept by a native Chilean tribe and bred them into the breed. Besides the color of their eggs, some other interesting attributes of the breed are their lack of a tail and the fact that their earlobes are partially hidden by tuft feathers. These traits can be traced back to these birds being crossed with the Collonca, who had no tail and the Quetero, which had tufts at their ears. The color of their eggs also come from the Collonca breed that laid blue eggs. When crossed with any other breed of chicken the Araucana Chickens offspring will produce a variety of colored eggs from greenish blue to green, pink, and yellow. This is how the breed really took off in the 1970's as hatcheries advertised them as the Easter egg birds that laid multicolored eggs. The breed was first introduced into the APA in 1976.